Remember When Jacking Off Caused Insanity? Medical books are fun, especially the really dusty ones no one reads anymore with information no one believes anymore, like this 1845 tome describing mental illness, the main cause of which, of course, was widely believed to be masturbation — or should we say, self-pollution? 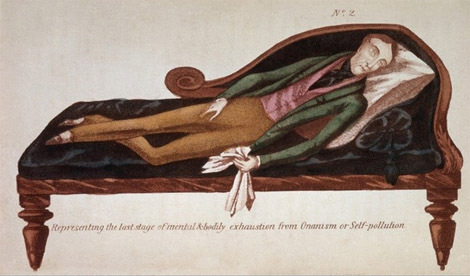 This is an engraving from The Secret Companion, a medical work on onanism or self-pollution, with the best mode of treatment in all cases of nervous and sexual debility, impotency, etc., by R. J. Brodie, 1845, Plate 2. What a long way we’ve come — well, all of us except maybe for Christine O’Donnell.